Liberty High School senior Sophia Englehart talks about her experience as an intern at The Delaware Gazette to fellow students in the Olentangy Academy Mentorship Program on Monday morning. Students participating in the program gained work experience this fall at a wide range of businesses throughout Delaware County, said Mentorship Coordinator Sue Andrews. 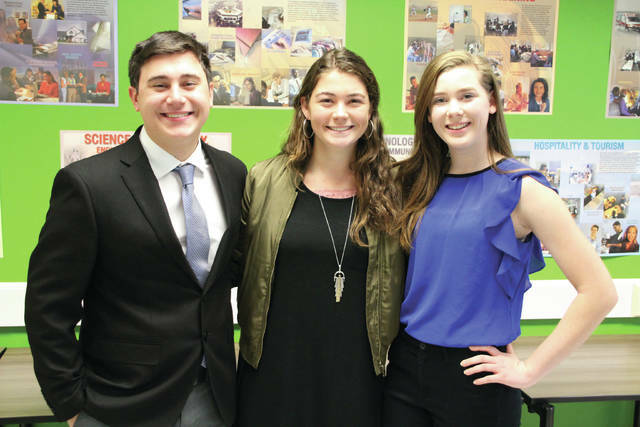 Olentangy Academy Mentorship Program participants, from left, Sam Uehlein, Sophia Englehart, and Samantha Gossett were among the students who made presentations about their internship experiences on Monday. All three are seniors at Olentangy Liberty High School. 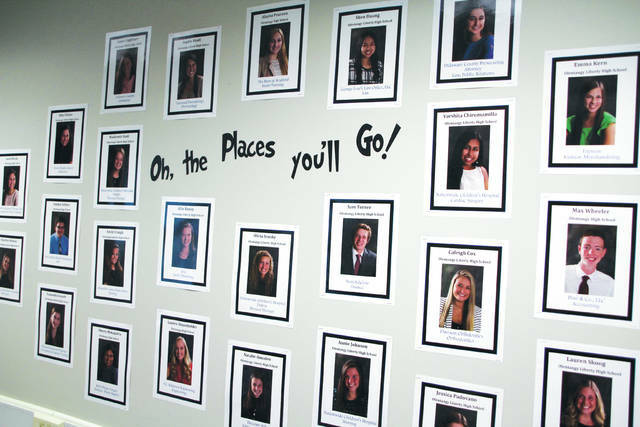 The familiar quote from Dr. Seuss is at the center of a group of photographs of students participating in the Olentangy Academy Mentorship Program. Sue Andrews had the look of a proud parent after listening to students in the Mentorship Program at Olentangy Academy talk about their experiences in professional settings this fall. Samantha Gossett, a senior at Olentangy Liberty High School, was an intern at Fourish Integrated Therapy LLC on Northwoods Boulevard in Columbus. Gossett said she’s “leaning toward nursing” as a career choice, but is trying to get an overview of what the entire medical profession has to offer. She‘s been accepted at Xavier University, Capital University, Ohio University, and University of Findlay. Sam Uehlein, also a senior at Liberty, chose to do his internship at OrthoNeuro under the direction of Dr. Gary Millard. OrthoNeuro offers neuro-musculoskeletal care at six central Ohio locations. Like Gossett, Uehlein has received acceptance letters from multiple universities. “I’ve been accepted to Ohio State University, University of Cincinnati, University of Pittsburgh, and I’m waiting to hear back from Miami University,” he said. Both Gossett and Uehlein said they learned some valuable life lessons beyond the skills of the professionals they worked with for the past few months. Uehlein said the real-world experience he gained — especially learning time management — was valuable. Liberty senior Sophia Englehart chose to do her internship at The Delaware Gazette. During her presentation on Monday, she told her classmates that her sister, Maria, who was in the Mentorship Program last year, inspired her to get involved in the program. So did Englehart, a writer and editor for Liberty’s school newspaper The Cannon for the past three years, achieve her goal of determining if journalism is the right career choice during her time at The Gazette? “I feel like that’s a yes, for sure,” she said. Englehart is one step closer to realizing her dream. 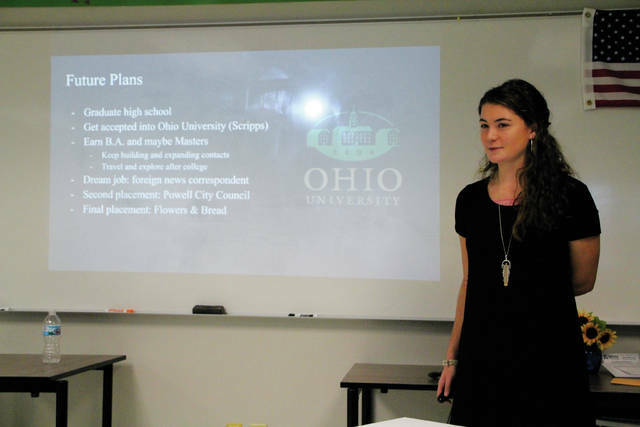 She was recently accepted into the Ohio University Scripps College of Communication.